Learn how to make a simple origami leaf. These pretty paper leaves make great decorations all year round. You can use green, yellow or orange paper depending on the season. There are many ways you can use the origami leaves. For example, you can arrange them in a wreath at Christmas or use autumn colored origami paper for use in your Fall and Halloween DIY projects. 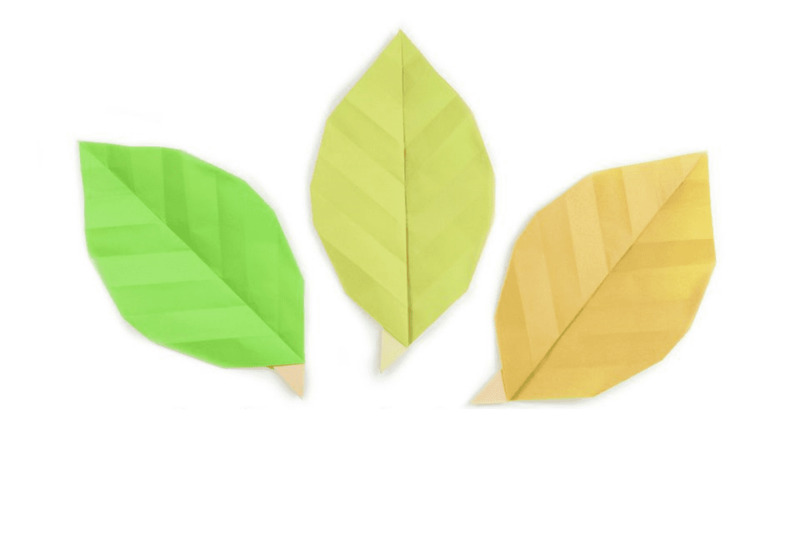 A nice craft activity for kids would be to use plain white paper to make these origami leaves, and after they are complete you can either dip them in paint or paint directly onto the leaves to create lots of different looking leaves. These paper leaves would also look wonderful hung up on a garland which could also include other paper crafts and origami models such as origami flowers or origami hearts. This is a traditional origami model. You'll need 1 sheet of square paper for this. In the tutorial, the paper size used was 15 x 15 cm. 1. Start with your paper color side up, this color or pattern will be the color of the leaf. 2. Fold your paper diagonally in half, bring the top left corner down to the bottom right corner and crease well. 3. Next, make another crease, starting from the top right point, down to the bottom left point, the section should become larger towards the bottom left. 4. Flip the paper to the other side, from left to right. 5. Fold the top point down to the bottom left corner and crease well. 6. Next, fold the top point and bottom edge to the crease you just made. 7. After unfolding, this is what you should have. 8. Flip the paper over to the other side, from left to right. You now have four horizontal mountain folds. 9. Next, you'll need to make four creases in between the mountain folds. 10. Bring the top point down to the first crease from the bottom. 11. Next, fold the top and bottom to the nearest crease. This makes eight equal sections. 12. Now it is time to make the leaf shape. You can do this several ways to achieve different shapes. This one will be generally rounded. Fold the top layer of the bottom right corner inwards, aligning along the third horizontal crease from the bottom. 13. Round out the leaf further as shown. 14. Next, flip the leaf over to the other side and repeat the same steps on that side. If you want a non-symmetrical look, make it a bit different. 15. Now you can open out the leaf and it's now complete.